HIROSHIMA, Japan (AP) — Ryosuke Kikuchi drove in the go-ahead run on a squeeze bunt in a four-run ninth inning as Japan beat the MLB All-Stars 5-3 Tuesday and took a 3-1 lead in their six-game exhibition series. MLB led 3-1 when Kirby Yates walked leadoff batter Kazuki Tanaka, who stole second and scored on Seiji Uebayashi’s single just past the glove of diving shortstop Amed Rosario. Kosuke Tanaka hit a tying single, John Brebbia relieved and Kikuchi bunted up the line toward first baseman Carlos Santana for a sacrifice as Tanaka crossed the plate with a headfirst slide. 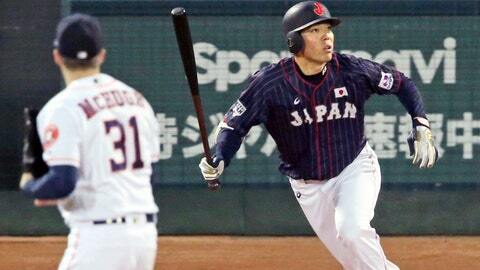 Yuki Yanagita added an RBI grounder for Japan, which was the visiting team. Rhys Hoskins hit an opposite-field solo homer to right in the second and Ronald Acuna Jr., voted National League Rookie of the Year on Monday, made it 2-0 in the seventh when he scored on a double by Juan Soto, who finished second in the voting. Akiyama hit an inside-the-park home run past a diving Soto and into the left-field corner in the eighth. Santana had a sacrifice fly in the bottom half off winner Yuki Matusi. MLB starter Kenta Maeda, who spent nine seasons with the Hiroshima Carp before signing with the Los Angeles Dodgers ahead of the 2016 season, allowed one hit in two innings before Matt Andriese relieved. Hiroki Kuroda, a former Hiroshima and major league pitcher, threw out the ceremonial first pitch. Yates dropped to 0-2 in the series, allowing four runs — two earned — two hits and two walks in two-thirds of an inning. Yasuaki Yamasaki got three outs for the save. The final two games are on Wednesday and Thursday in Nagoya.